to over 50 percent renewable electricity. The entire series will appear here. What does it take to reliably operate a very large and very green electric grid? I started to answer these questions at the November retreat of the Sacramento-based Center for Energy Efficiency and Renewable Technologies (CEERT). As the retreat wound up, I still had several unanswered questions about how renewables actually would keep the lights on 24/7. How can a green portfolio actually provide both the lion's share of energy as well as the so-called reliability services that are essential to keep the grid up and running? There seemed to be a lot hanging on the wonky details flagged by CEERT. So, after the retreat, I drove up the coast to raise my concerns with Dave Olsen, who had just been reappointed to a second three-year term on CAISO's Board of Governors. We met for breakfast at a diner in Ventura, an aging beach community 60 miles north of Los Angeles, perhaps best known today as the headquarters of Patagonia, the eco-oriented outdoor clothing company founded by legendary climber Yvon Chouinard. Olsen, a UC Berkeley graduate, spent much of the 1980s and early 1990s bringing new California wind and geothermal projects to market. In 1996, while between jobs, he was recruited by Patagonia to become its new president ("Yvon took me rock climbing for my job interview") and still lives nearby. Under Olsen's tenure, Patagonia became the first American businesses to contract for local wind power; it also began to track and reduce its carbon emissions. After leaving Patagonia in 1999, Olsen expanded his efforts to advance the state's renewable energy sector, helping to plan various new transmission facilities to connect inland wind and solar farms to coastal markets. 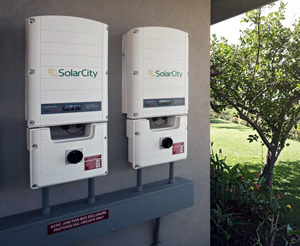 He continued his work for CEERT (he first joined the board in 1991), and for a decade also served as the managing director of the Western Grid Group, a coalition of former energy officials seeking to make it easier for neighboring grids to share power -- in many ways, the forerunner to a multi-state ISO. All this has made the ISO "a key player -- also unexpected," he said, and then paused. "It certainly wasn't always that way." I asked him what he meant. "The turning point may have come in 2011," he said. "There was an informational trip to Spain for some state energy officials and policy people, including Mike Peevey," then head of the California Public Utilities Commission (PUC). "As one of the study group told me," said Olsen, "the group was in the control room for Red Electra [manager of Spain's grid]. While they were standing there, someone showed them that 50 percent of the power on the system was renewables, probably mostly wind. Well, Peevey was astonished, I was told. He reportedly said, 'We're being told by Mansour [Yakout Mansour, then CEO of CAISO] that 20 percent is the best we can do.' But here was this grid running 50 percent. "I think that may have started to shake things up because the group saw that you could manage a whole lot more." Mansour was succeeded by Steve Berberich, a straight-talking Missouri native with a finance background who previously had held several senior positions at CAISO and worked for a major utility. Berberich had paid his dues in the energy industry but plainly had a different attitude toward renewables. He wanted to make things happen. As the state's senior "grid master," he soon began to tout California as a renewable energy showcase for the rest of the world. For Berberich, that provides the ISO with "a cool opportunity to show how it can work." "Steve has really turned things around," said Olsen. "It's a tough job... You have to understand, we don't have much control over the mix of resources we get at the ISO, the people who are generating power around the state. That's largely the PUC's job. Rooftop solar, home owners -- how much of that gets sent to the grid is also beyond our control." Olsen didn't mince words: "We are responsible for keeping the lights on. But the fact is that we are not getting the resources we need. You just can't run a system with only PV and solar photovoltaic -- and that's what Californians love right now." Echoing the warnings I heard from CEERT, Olsen said that for the ISO, the problem had reached a critical level. Since 2010, the state has added roughly 500,000 solar rooftops (over 4,000 MW of PV) and utility-scale installations had added 8,000 MW of capacity, equivalent to roughly 30 new gas-fired power plants or a dozen nuclear ones. That means on sunny days, by mid-morning, within a couple of hours the ISO must find room for an additional 8,000 to 10,000 MW of largely PV-based generation -- enough to supply roughly one-third of the ISO's total demand from several million homes and businesses. To do so, it must direct numerous gas-fired generators (plus some hydro and geothermal plants) to back off production; otherwise, some of the PV energy will overload the grid. This unwanted energy is termed "over-generation" and must be rejected or, in grid speak, "curtailed." That has financial consequences, as generators don't get paid. It also undermines the state's GHG reduction goals. Likewise, as the sun sets in late afternoon, the ISO may need to ask 11,000 to 12,000 MW of non-PV generators to ramp up. This is crucial to closing the deficit when solar PV energy abruptly falls off and the overall demand for power rises sharply (well above the morning's peak demand) as millions of Californians come home, turn on the lights, cook dinner and power up their favorite electronic devices. These large energy swings and the related demands for ramping up generation have stressed the grid. Many generators (wind, small hydro facilities and combined heat and power plants) cannot physically ramp up and down in short periods. In addition, at least a half-dozen more versatile gas-fired plants, sited along California's coast, will retire soon due to stricter environmental regulations on the use of seawater for cooling. None of this is news for California energy wonks. The CAISO has flagged the issue since at least 2012 when Olsen first joined the board. To socialize the problem, the ISO's public affairs group, then led by Karen Edson, came up with a now-famous infographic. 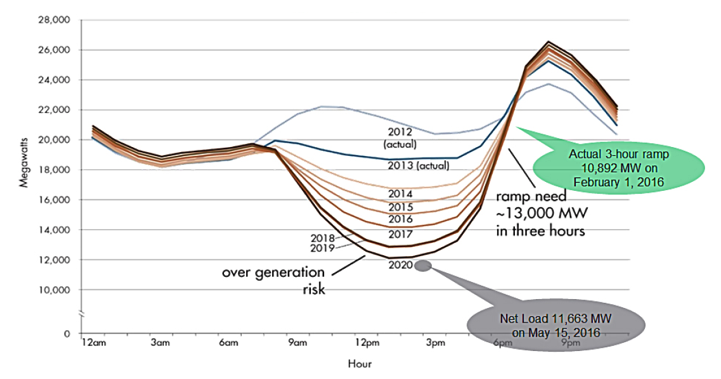 During a 24-hour period, a line graph of the fluctuating net energy demanded from the grid (that is, the overall demand minus PV generation) looks strikingly like the silhouette of a floating duck. In the morning, as solar energy floods the grid, the line curves downward (tracing the concave belly of the duck); then, in the late afternoon, as solar energy falls off and net demand grows, the line rises steeply (mirroring the duck's neck), only to decline again in the late evening (tracing the head and beak). Voila: the "duck curve" was born. In the ensuing years, the ISO, the PUC, the state's energy commission and private interests (utilities, efficiency advocates, electric storage groups and rooftop solar suppliers) have all weighed in on the problem. Consultants also have had a field day explaining how to "put the duck on a diet" or "teach the duck to fly" so as to flatten the net demand curve. The magnitude of the problem also has been questioned. However, in October, a data analysis by an independent expert showed that thanks to the rapid buildout of utility-scale solar farms, the duck actually was quacking more loudly than expected. The size of the ISO's 2016 energy ramp was four years ahead of the forecast, exceeding prior expectations for 2020. So what is to be done? In Olsen's view, as with the CEERT, there is no single fix -- large amounts of storage, for example, or more wind and geothermal energy to balance solar. The key is to make the grid more "flexible." That can be done in a number of ways. Consumers can help by shifting more of their energy demands to off-peak periods. On-site storage may aid that, for example, by soaking up excess solar generation during the day and using it in the early evening. The planned shift to time-of-day pricing for all non-residential customers, which would discourage more consumption in peak hours, is also likely to help. But grid-scale investments are likely to be most important. Chief among those, suggested Olsen, must be a concerted effort to ensure that the next tranche of renewable generation in California is not only "least cost" but "best fit" for the future grid so that the ISO reliably can operate in 2030 with at least half renewables. "It's the law now, with SB 350," said Olsen, "but we are still waiting for the results." Later on my trip, when I asked a senior official at the PUC to respond, I was told that the state's past success at meeting green energy targets had given the agency some leeway. "Our utilities just don't have any pressing need to buy more renewables," said Nicholas Chaset, chief of staff to the commission's chairman. "They've got a large reserve margin and have bought all the renewables they need to meet mandates beyond 2020 and, for San Diego Gas & Electric, maybe up to 2030... If the utilities aren't buying, a new plan isn't going to change things right away, so we have more time to work on the process and get the model right." Chaset acknowledged, however, that "there may be some fundamental disagreement" between the commission and the ISO on how much "flexible resources" are needed. "They're actually coping pretty well with the duck curve," he said. "We hear from lots of groups who have they're own preferred resources, for pumped hydro, geothermal or thermal solar... but these are just tools for the overall plan which must meet consumer interests, too." Nevertheless, Chaset was clear about the PUC's new goal: "We are going to set aggressive carbon targets," he said. Then we'll "probably let the load serving entities, the utilities, determine how to meet them and where to get the reliability services." Chaset also admitted that using CO2 reductions as an across-the-board guide represented a big shift for the PUC. "We're used to handling all of this in different dockets, with demand response, efficiency, renewables procurements, storage, distributed resources and more." So one main challenge has been to determine how to value different policy and procurement options in terms of carbon reductions, making "apples-to apples" comparisons. The PUC "needs to agree on a methodology to do that," said Chaset. We're "turning around a very big ship... trying to align lots of proceedings with different staff, different presiding officers and different presiding commissioners... That's tough."